Page Updated:- Saturday, 09 February, 2019. Above photo, 1920s, kindly sent by Michael Mirams. Above photo, circa 1970, kindly sent by Rory Kehoe. 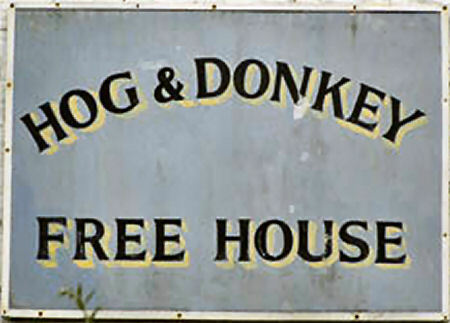 The "Hog and Donkey" is a unique public house name in Britain. 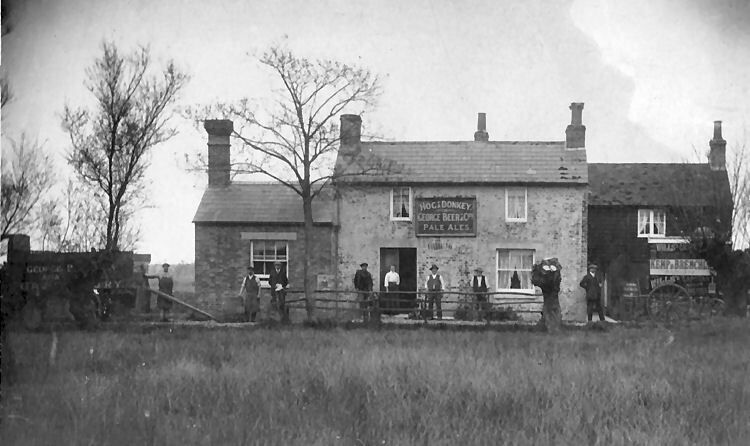 This tiny, remote inn was a beershop in 1900, but the following year the brewers, George Beer of Canterbury, successfully applied for a full licence with the blessing of the local vicar. From the Whitstable Times and Herne Bay Herald, 31 March 1900. Price 1d. CHISLET. GIVEN THE BENEFIT OF THE DOUBT. Frederick Cleaver, landlord of the "Hog end Donkey" beer-seller, Chislet, was summoned for permitting drunkenness on his licensed premises on the 22nd February. Mr. G. Thorn Drury, Instructed by Mr. A. K. Mowll, appeared for defendant, who pleaded not guilty. Sergeant Heard deposed that about 3 p.m. on the day in question, he visited defendant's off licensed premises at Marshside, Chislet, in company with P.C. Luckhurst. On approaching defendant saw witness and Luckhurst coming, and took a pint pot out of the hand of a man named Harry Steed, who was in the beer store at the side of the house. Defendant then stood the pot behind a beer barrel. Witness asked defendant what was the matter with the pot, and he replied "Nothing." Witness examined it and found it contained a small quantity of beer. Witness told Steed he had no right to be drinking there on off licensed premises, and that he was drunk. Steed said, "I have only had one pint. I sold Mr. Cleaver some poles for 2s, and I stood a pint on the deal." He (witness) said to Steed "You have been here two or three hours, and would not be that time drinking a pint." Steed then replied that he had had two pints. He did not drink it inside, but drank it outside. He paid 2d. for it. Defendant said he stood the drink. Witness requested Steed to leave the premises. He declined to do so at first, but afterwards walked away. He staggered along the road, and was foaming at the mouth. As he was too drunk to take charge of his horse and tug, which was standing close by, witness and Luckhurst drove him home. When witness served the summons on defendant he said, "The man would not go. he seemed mesmerised when he saw you coming, and would not leave when you told him to. In reply to Mr. Drury witness said he had never seen Steed drunk before in his life. He knew Steed's brother was subject to fits. Thomas Bradley Collins, watchmaker, of Mortimer Street, Herne Bay, deposed that on the 22nd February he was at a cottage near defendant's house when Sergeant Head called him outside to see the condition of Steed, who was walking along by the side of his tug. He was very unsteady. When the Sergeant stopped him he said be was not drunk, and had only had a pint of beer. From the way he acted witness thought he was drunk. He foamed at the mouth terribly. Mr. Drury submitted that no case had been made out against the defendant. Before the Bench could convict they must be certain that defendant knew of the condition of the man. It was not sufficient to show that the man was on the premises, it must be proved that the man's conduct was such that the licensed victualler knew he was drunk. He suggested that Steed was not drunk at all. The Bench retired, and on returning into Court the Magistrates' Clerk (Mr. W. N. Wightwick) said the Bench were of opinion that there was a bona fide case against defendant. Mr. Drury then called the defendant, who stated that he had known Steed all his life, and had never known him to be drunk. On the day in question Steed asked him if he would buy poles. Witness was in the beer store and Steed was outside. Witness agreed to purchase them for 2s., and they were thrown over the hedge into his garden. Witness asked Steed to have a glass of beer, and he said he could drink some. Witness draw a pint, and he and defendant had it between them. Steed put the pot on a barrel in the store, and as it was in witness' way he put it down behind the barrel. He did not do so with a view of hiding it from the police. Re was putting some beer in a bottle for a Mrs. Ruck when the Sergeant walked in. William Ruck, labourer, corroborated. Up to the time that he left Steed had shown no signs of being drunk. Alice Ruck, wife of the last witness, stated that on February 22, between 2.30 and 3 p.m., she went to the defendants house for some beer end some bread. She saw Steed, who appeared quite sober. Mr. Drury having addressed the Bench, and repeated the argument that it had not been proved that the defendant had knowledge of the man being drunk, the Chairman said although it was a very proper case to inquire into the Magistrates had decided to give defendant the benefit of the doubt and dismiss the case. There was no reflection on the conduct of the police sergeant. A summons against Steed for being drunk on licensed premises was then gone into. Defendant pleaded not guilty, and said that he only had two pints of beer all day. He had one pint of beer at the "Hog and Donkey," which defendant gave him. He was not drunk. The evidence given in the previous case having been repeated, the Bench fined defendant 1s, and 11s. 6d, costs. Whitstable Times and Herne Bay Herald, Saturday 18 March 1950. Wine licences were granted to the "Hog and Donkey," Chislet, and the "Welsh Harp," Sturry. 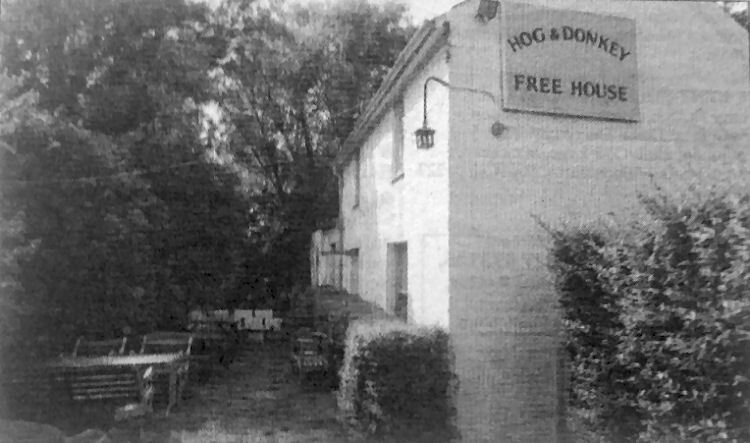 Do you remember the Hog and Donkey pub? AS THE county is swamped by gastro pubs and chains, theme nights and happy hours, good old fashioned pubs with eccentric landlords are few and far between. One of the most fondly remembered of these, and by far the oddest, was the "Hog and Donkey" at Marshside, which closed 18 months ago after more than a century. The pub on North Stream was hard to find, tucked away behind trees and an ivy-clad garage housing a 1920s Bentley. The land around it was filled with rusting Jaguars and Austins. 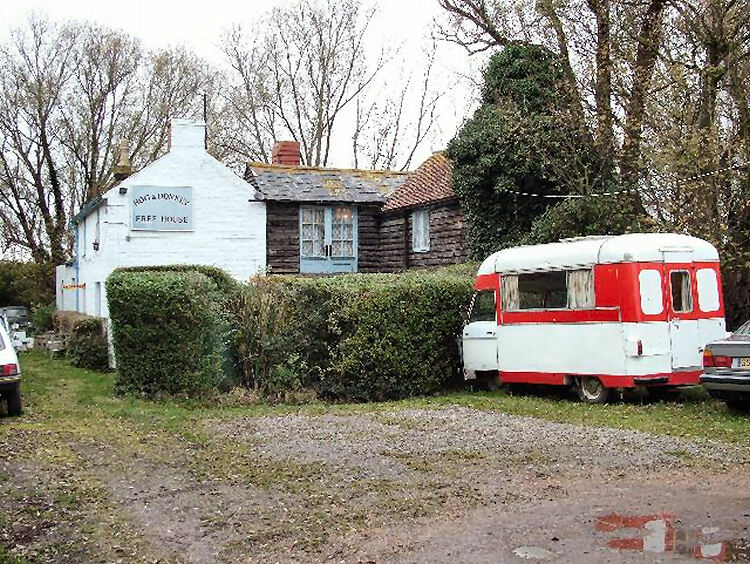 Dennis Maynard, the landlord from 1966, was known throughout east Kent for his Jimmy Edwards' handlebar moustache, his sense of humour and rather unusual ways. Sadly, his wife Jo died while the couple were on holiday in Spain during the 80s. Graham Potts, local representative of the Austin Counties Car Club visited the pub once a month for 10 years for club meetings. He said: "Dennis was heavily into cars and had a field of dead Jaguars out at the back. "Walking into the Hog was like walking into a time warp. There was a bottle of alcohol called Green Goddess that sat in the same place, unused, from at least the 1970s when I first went there." Tales about Dennis have found their way into urban folklore. The most often retold, in various different guises, was when Dennis had his appendix removed and was sewn up after the operation by the surgeon's son, a vet. Dennis sold the story to The Sun and made the front page. The legendary landlord is now 88 and lives in Shottendane Nursing Home. His many classic cars were taken away by a scrap dealer shortly after the pub closed. The property has since been sold and is being renovated. 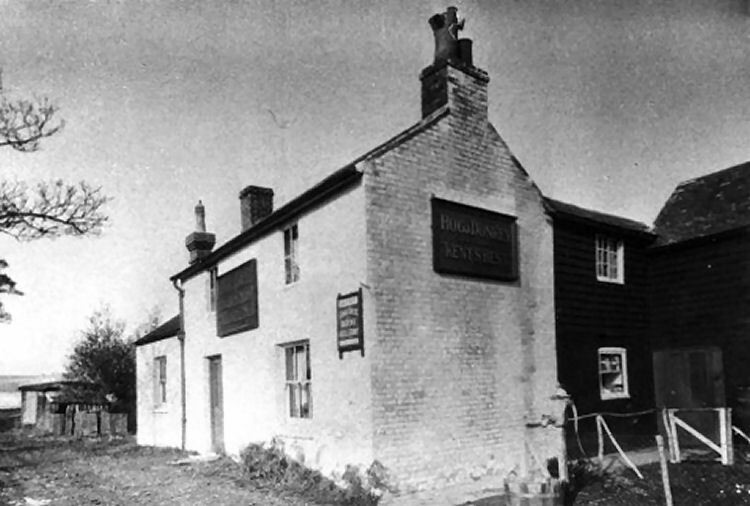 Stewart Tophill, landlord of the "Huntsman and Horn" at Broomfield, knew Dennis for many years. He told me how he acquired his famous blue 3.5l Rover. "It was Jo's birthday," he said, "and he took her for lunch and then on to a hair appointment. On the way she commented on a blue Rover in a dealership window they passed. "After Dennis dropped her off, he went straight round to the garage and bought the Rover and when Joanna came out of the hairdresser, there he was sitting in it, ready to drive her home. She loved it." Dennis Maynard (who ran Addison's Motors in nearby Upstreet) and his wife Joan took on the tenancy with George Beer & Rigden in 1949 and almost immediately, became Fremlin's tenants, when George Beer and Rigden were bought out. The pub was earmarked for disposal, soon after Whitbread's took over Fremlin's in 1967 and was purchased by Dennis and Joan as a free house. With his famous handlebar moustache, Dennis was a very well-known character in the area and visits to his quirky pub were always memorable, especially as he had no sense of what licensing hours were all about: late lock-in's were the norm! Following Joan's death in the mid-1980s Dennis became somewhat reclusive and after becoming the victim of a late night armed raid in 1991 his opening hours became even more erratic. The exact date Dennis pulled his last pint in open to question but it's certain that he notched up a half century of service at the pub before finally retiring some time in the early/mid 2000s. The pub and outbuildings lay derelict for some years but were sold c.2008 and the site re-developed. A sad loss - one of Rory Kehoe's all time favourite eccentric pubs! I have just added this pub to that list but your help is definitely needed regarding it's history. I am informed that Dennis Maynard passed away at Shottenden Nursing Home, Margate on 3rd June 2012, aged 90.